For the moment (okt 2002) several big magazines and TV programs all over the world contacts me daily to do reportages. Last winter I gave Bike in Sweden,Norway,Finland and Moto Journal in France the chance to come here. For sure they left Nälden with a experience they won't forget soon. It resulted in a 8page story and frontpage in France and the Bike story is coming out any day. I prefer reporters and testpilots come here for serious testing during 2 days to give Iceroadracing a fair judgement. The project has been presented at some locations and interest has been way more than expected. At the Stockholm motorcycle show it some times got so crowded in front of the Iceroadracing stand that I couldn't leave or enter my stand. 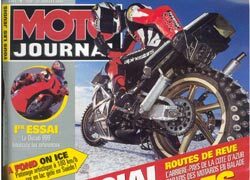 1997 I made a presentation of Iceroadracing at the European championship Dutch open in Holland, British Superbike at Cadwell park, and World Superbike at Assen. One rider at Assen even crashed his paddock scooter in front of my bikes due to the surprise when he saw them (so Ice-roadracing can be dangerous). But after seeing the video from on board-camera (download the film) and listening to the arguments about why to use Iceroadracing during the off season they agreed totally. One big team from Asia was so interested that they during one weekend visited the Iceroadracing stand outside the paddock 13 times with questions and cameras. The most famous and serious international testrider for magazines in the world said in Assen that "this (Iceroadracing) is exactly what we need during low season to make us competitive". World Endurance champion 2000 (Peter Linden) and others wrote the same. At the Scandinavian open championship final at Anderstorp, all competitors (accept for one) signed on the support list for the project, so the interest to start Iceroadracing is massive, especially outside Sweden. This interest has resulted in several invitations from companies and exhibition in Europe to use Iceroadracing as public magnet.A successful street riders course with 14 members from a motorcycle club was done. They where very surprise about the great grip and how fun it was. They developed their riding skill very fast, too fast almost. One guy even fell in a corner exit, but he just picked up the bike and went for 4 more laps with out go to pit . Several guys in the group learned to slide after just 6-12 laps. All asked when they could do this course again.